In the 1950s, the legendary Compagnie Générale Transatlantique, or CGT – much better known as the French Line outside of the French-speaking world – discerned the need for a new flagship. The vessel that was born as a result was the longest passenger liner in the world, and would remain so for 42 years from the time of her maiden voyage. The contract for construction of the liner went to Chantiers de l’Atlantique, a shipyard at the mouth of the Loire River which had built all previous French Line ships. Hull G19 would come in at an astounding 1,035 feet in length, with a gross tonnage of 66,348. 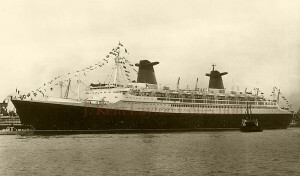 While she was some four feet longer than the Queen Elizabeth, and 16 feet longer than the Queen Mary, she would not take the record as the largest in-service passenger ship when she first entered service; that honor would be retained by the Queen Elizabeth until the Cunarder retired in October/November 1968. In the shape of her hull and in first impressions, the new France immediately brought to mind the shape of her great predecessor Normandie. Her profile diverged from Normandie‘s in that she bore only two funnels rather than three, and in that they were of a unique design. Viewed from above, the funnels’ primary vertical segment was teardrop-shaped; but at their peaks, they flared out into wings – a unique design of the period that was not seen again in major ships until the Carnival Cruise Company adopted a similar style of winged funnel for their vessels. In the way of machinery, the France bore a oil-burning steam turbine powerplant which had the ability to push her along at over 35 knots during her trials, and without the vibration that had plagued the Normandie nearly thirty years before. Her interiors spaces, however, were not exactly successful in execution. Where the Normandie had soared to daring heights, the France plumbed the depths of late 1950’s and early 1960’s interior design. 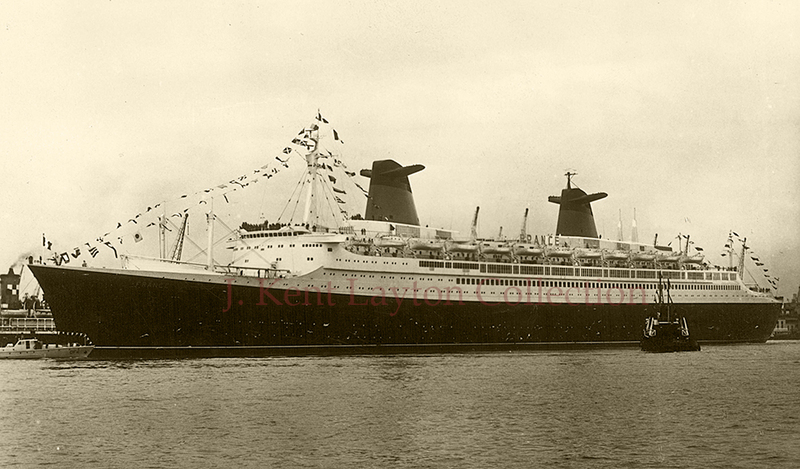 It was authentic to the period, it was very modern, but it looks far more dated today than those of the Normandie or, really, nearly every other liner ever built. Despite her rather utilitarian interior decor, the France made a successful career during bleak times on the North Atlantic. She ran opposite the SS United States, Cunard’s Queen Mary, Queen Elizabeth, and later Queen Elizabeth 2, and a number of other ships struggling to compete against the speed and the golden era of jet travel. It was a battle they were doomed to lose. One by one, her competitors dropped out of service, until she and the QE2 were left alone. Semi-dependent on each other, since passenger numbers did not warrant building a second ship to pair up with their existing flagships, Cunard and the French Line agreed to sail the two ships on an opposing, and therefore complementary schedule. This allowed for a weekly trans-Atlantic service to be maintained by even though each company had only one primary ship to run it with. 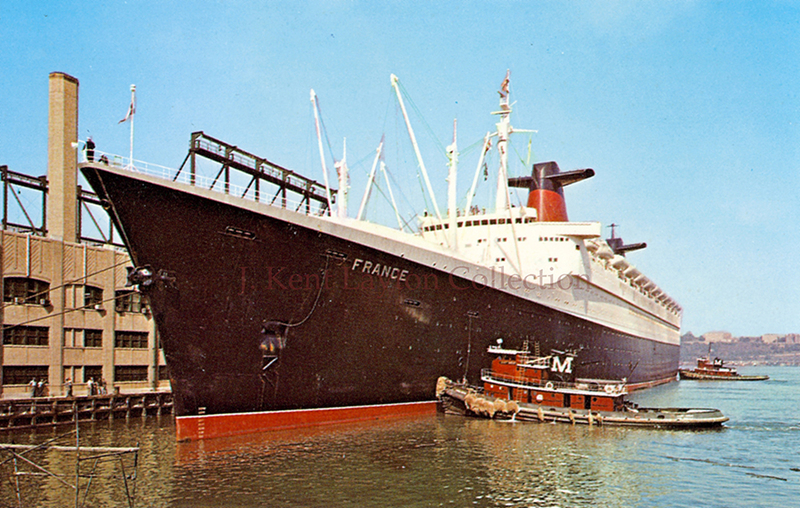 In the autumn of 1974, after an embarrassing crew mutiny and plagued by rising costs, the France was withdrawn from service and laid up.Her career as the France had ended. She had made 377 trans-Atlantic crossings and 93 cruises; she had carried 702,066 passengers over some 660,000 nautical miles. Her future looked bleak, even though for an Atlantic liner she was still very much in her prime. 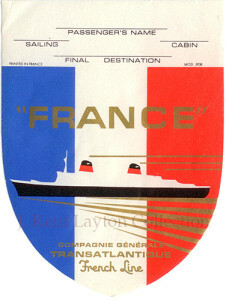 On June 25, 1979, the France was purchased by Norwegian Cruise Line, which was then expanding its Caribbean itineraries and was very much in need of a new flagship. She was taken to Bremerhaven, Germany, for a thorough conversion. The ship’s two-class passenger accommodations were converted to a single-class system, her public rooms received extensive modifications and updates, two of her four propellers were removed in the interests of economizing her operation costs, new pools were installed and a unique Sun Deck was built astern, which overhung her original fantail. She was also given a new coat of livery: a deep blue hull, white superstructure, with a white, light blue, and deep blue pattern on her smokestacks. 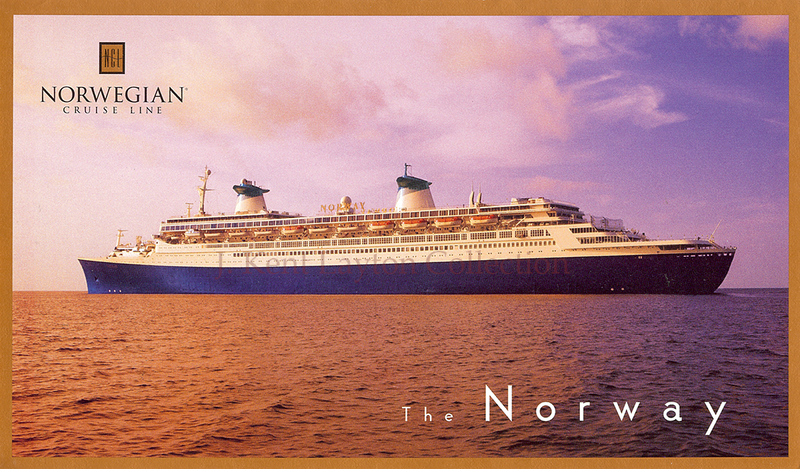 Renamed the SS Norway, she made her maiden voyage to New York in May of 1980, and then sailed down to begin a mostly-charmed career as a cruise ship. The Norway was the largest passenger ship in the world, she had been saved from oblivion once already, and some would argue that her finest days were yet ahead of her. Although her top speed was reduced, she could still make an easy 25 knots through placid Caribbean seas, with tourists splashing in her pools and basking in the nostalgia of the trans-Atlantic liners’ heyday. In 1990, in order to compete with newer cruise ships such as Royal Caribbean’s 1988 grande dame, the Sovereign of the Seas, and her two later sisters Monarch of the Seas and Majesty of the Seas, which bore many balconied staterooms, two new decks of suites were installed atop the Norway. To this day, purists moan and whine ad nauseum about how the alteration indelibly ‘ruined’ the liner’s profile. Personal opinion aside, it was a practical addition, as the new staterooms made her more appealing to prospective passengers looking for more modern amenities. In an industry that was growing ever-more competitive (not unlike the way the Atlantic trade had grown so ferociously competitive in the late 1800s and early 1900s), it was important to stay current. At the very least, keeping her operating in the black was simultaneously ensuring a delay of the inevitable day when she would make her final journey to a scrapyard. Another alteration came in late 1996, when her funnels were painted in a royal blue with the gold letters “NCL” emblazoned on their sides. Again, purists were not all ‘on board’ with the change, but it was a fresh look for a modern time. 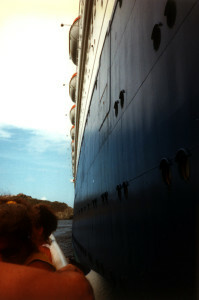 Unfortunately, the great liner was beginning to show her age, as well. Keeping ahead of maintenance is always an important thing to do with any ship, especially one that is forty-odd years old. Yet it is not uncommon for the companies running great liners to try to ‘stave off’ expensive maintenance for as long as possible. The Norway‘s boilers had shown signs of potential trouble within just a short time from when she began cruising, and they certainly had not improved with age. On the morning of May 25, 2003, the ship returned from one cruise and was preparing for the next when one of her boilers exploded. Eight crewmen were killed. At this point in her career, it would have been financial idiocy to replace her steam powerplant with a diesel one, as had once been done to the Queen Elizabeth 2, and there was no way to use her with dead engines. She was laid up in Europe, renamed Blue Lady but totally inert. Finally, she was sold for scrap, towed to Alaing, India, and cut up. It was a sad ending for one of the greatest liners in maritime history, but she was by no means alone in her ignominious end: Olympic, Aquitania, Queen Elizabeth … all of them had gone there unless they had sunk. Her career had spanned over 41 years, and she is fondly remembered today as a largely successful, grand ship. The video below contains news coverage from shortly after the boiler explosion that doomed the Norway. At the time, only four deaths were known. Some of the footage showing the damage is astounding.